Just like an alphabet is made up of individual letters, DNA is composed of chemical bases. And in the same way that letters must be placed in a specific order to form words and sentences, the sequence of chemical bases is incredibly important in how DNA functions and codes our lives. One reason scientists pay close attention to DNA sequence is that it can help them identify a gene or a mutation that may cause a disease. But the analysis typically requires sending patients' cell and tissue samples to well-equipped labs, which in many cases are located far away. This is a particular challenge in settings with limited resources—in developing countries and underdeveloped communities, for example—where health care workers do not always have the tools or the expertise to conduct DNA sequencing analysis. Now, a smartphone-based microscope developed by researchers at the California NanoSystems Institute at UCLA and at Sweden's Stockholm University and Uppsala University could make the mutation testing accessible to health care workers even in remote locations, without the need for large, expensive lab equipment. The device can image and analyze specific DNA sequences and genetic mutations in tumor cells and tissue samples without having to first extract DNA from them. The new device is described in a study in the journal Nature Communications. The research was led by Aydogan Ozcan, UCLA's Chancellor's Professor of Electrical Engineering and Bioengineering and an associate director of CNSI, and Mats Nilsson, a professor of biochemistry and biophysics at Stockholm and Uppsala Universities and the director of SciLifeLab in Stockholm. The study's first authors are Malte Kühnemund of SciLifeLab and Qingshan Wei of UCLA. Ozcan said the new device could be manufactured for much less than $500 each if it were produced in large quantities—far less expensive than the equipment labs use to conduct the tests today. 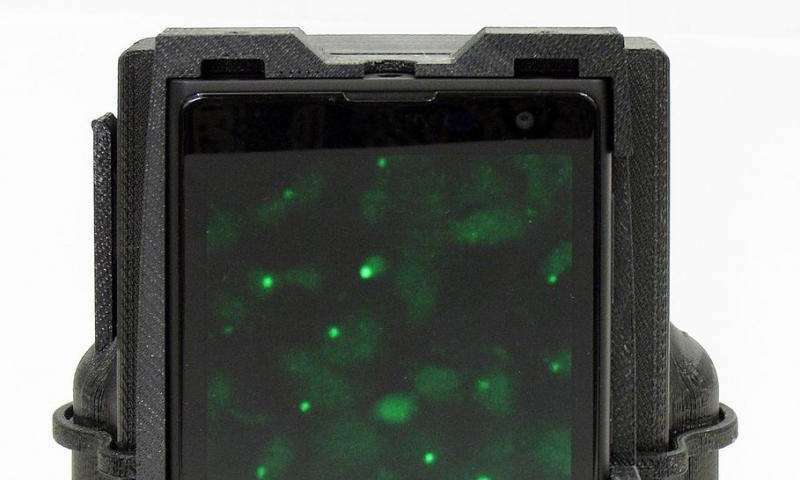 "A typical microscope with multiple imaging modes would cost around $10,000, whereas higher-end versions, such as the one we used to validate our mobile-phone microscope, would go for $50,000 or more," he said. Scientists identify cancer cells in part by their shape and other physical characteristics, or morphology. But determining optimal treatments for cancer requires supplementing that information with molecular diagnostics, which can help scientists identify the genetic mutations that cause the tumor. "It's very important to have these molecular testing approaches at a doctor's office or where care is being given," Nilsson said. "Oftentimes, advanced lab-based testing is performed at major hospitals, which is limiting, as not everyone has access to a hospital that can perform these tests." The research team designed the lightweight optical attachment to be used with a standard smartphone camera, and they produced the device using a 3-D printer. It can capture multi-color fluorescence and bright-field images at the same quality of those created by a traditional light microscope. To use the device, a technician places a tissue sample in a small container. 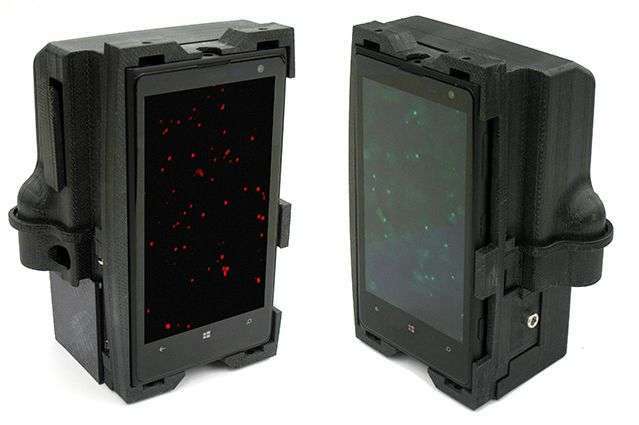 The mobile phone microscope records multi-mode images of the processed sample and feeds data to an algorithm, which automatically analyzes the images to read the sequenced DNA bases of the extracted tumor DNA, or to find genetic mutations directly inside the tumor tissue. This mobile microscope can detect even small amounts of cancer cells among a large group of normal cells. "Ultra–low-cost DNA sequencing and tumor biopsy analysis, in which morphology and mutation analysis are combined, can substantially decrease diagnostic costs and make it more widely accessible," Kühnemund said. Wei added that the platform could eventually also be used to identify disease-causing bacteria and microorganisms, and to measure the genetic signatures of antibiotic resistance. A real breaktrough to accelerate research and medical progress, with a strong impulse !! Any one will know what is good or wrong in the DNA of his cells ! !